August: Strawberries stacked in an artistic tower. Let your toddler count how many are there! September: Rich orange papaya contrasts with jet black seeds may make you think of beaches and dancing. October: Name this fruit! Red, orange, and olive green ~ have you seen it before? 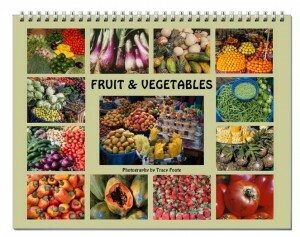 November: Colorful vegetable mix for cooks, vegetarians, vegans, and other health minded chefs. December: Lettuce, Broccoli, Cauliflower, Limes, and Potatoes – what would you make?